Now it’s time for us ladies to wear the most fun, colorful, happy, festive and cute Christmas sweaters! Christmas is such a happy season and I think everybody should have fun! I love going to Christmas parties where everyone wears a super cool Christmas sweater! Here are my top favorite Christmas sweaters for women in fun colors and cool designs! 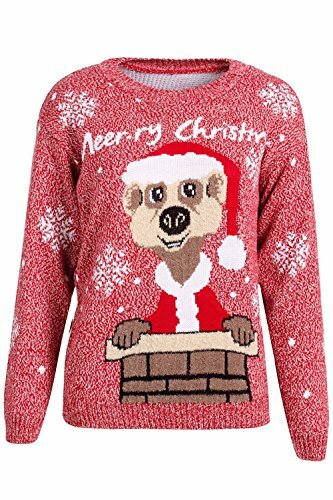 I found some of the most fun Christmas sweaters for women being sold right now! Fun Christmas sweaters are a great way to get right in the spirit of Christmas! On this page you are going to find a few of the cutest Christmas sweaters for women in my opinion! From cute Christmas trees sweaters to fun snowman and snowflakes sweaters and also a few Santa Claus Christmas sweaters for women too! They are fun, colorful and very cheerful! They also make cool gift ideas for ladies with a sense of humor! I think it’s a great idea to wear cool Christmas sweaters for a fun Christmas dinner party! I hope you’ll enjoy my selections and Merry Christmas everyone! 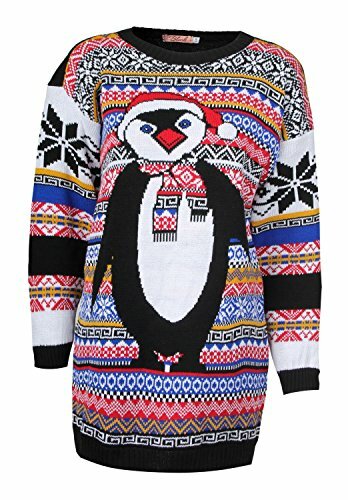 Cute Penguin Christmas Sweater for Women! This is actually an awesome Christmas jumper! It’s more than a sweater! I love how cute and festive it is! I also love the price! Great to wear for any Christmas party! 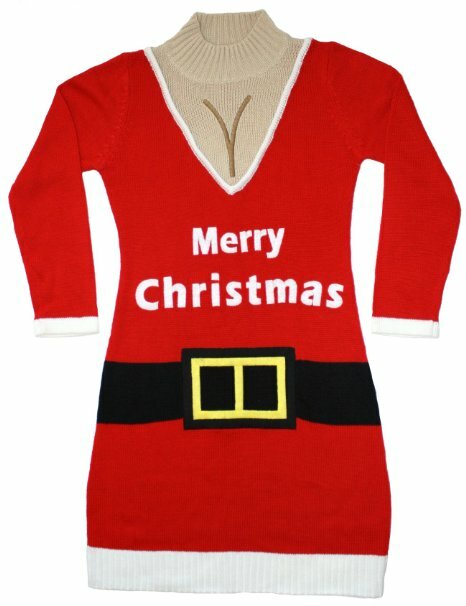 Funny Santa Suit Naughty Christmas Sweater Dress! Funny Christmas Theme Sweaters for Women! 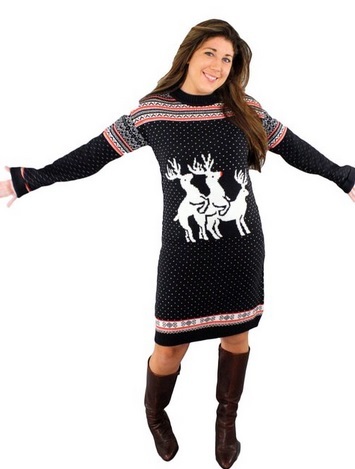 This Santa Christmas sweater dress for women is hilarious! If you have always wanted a large ‘chest’ minus the surgery, this is your chance! A happy buyer said this fun dress is also of great quality! This is definitely one of the funniest Christmas sweaters for women ever!! Fun Christmas Sweater for Women! I think this is a pretty self-explanatory funny Christmas sweater for women! You can also wear it as a dress! A happy buyer said no one expected her to wear something so… explicit! It was a huge hit at her Christmas party! Perfect for Ugly Sweater Fun Christmas Parties! 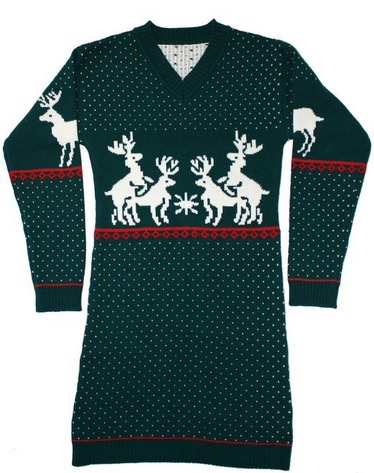 Another ultra-fun reindeer themed ugly sweater dress for women! Happy buyers love the long length! 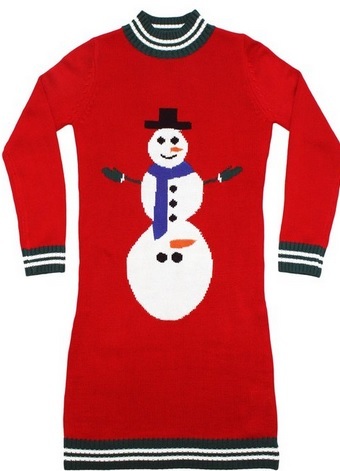 Cute and Fun Merry Christmas Sweater for Women! 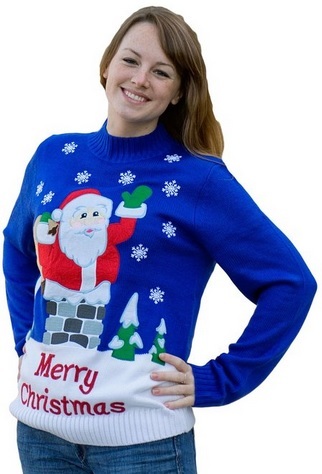 How fun, colorful and festive is this Santa Claus Merry Christmas blue sweater? I think everybody should wear one of these for Christmas! Cute Reindeer Red Sweater Dress! What a fun Christmas dress! 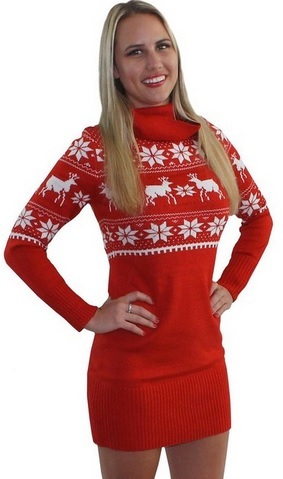 It is a fun and cute red sweater reindeer dress for women! Fun, Cute and Colorful Christmas Jumper Sweaters for Women! If you are looking for cute and very cheap women’s Christmas sweater dresses for sale you are gonna love these! They are all under 25 dollars and there are three to choose from! This adorable and very colorful red meerkat going down the chimney sweater dress is one of my favorites! 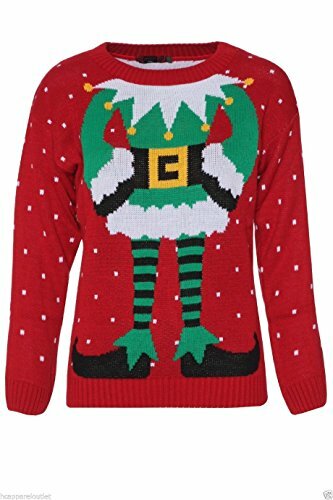 Fun Elf Body Christmas Sweater for Women! A cute and fun Elf body Christmas jumper for the ladies! Will put smiles on everybody’s faces this Christmas! *It’s available in red, black or gray! 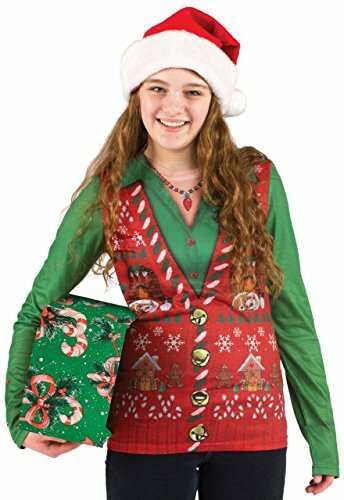 Fun Women’s Ugly Christmas Sweater Vest! You are going to look super ‘Christmas like’ wearing this cool red and green Christmas sweater vest and a Santa hat! Beautiful Santa Claus Christmas Sweater for Women! What a gorgeous and very well-made black and red tartan Santa Claus fashion Christmas jumper for sale! It also fits great and goes well with a nice pair of jeans or black pants! Best Christmas Sweaters for Women! This is beyond cool ladies! 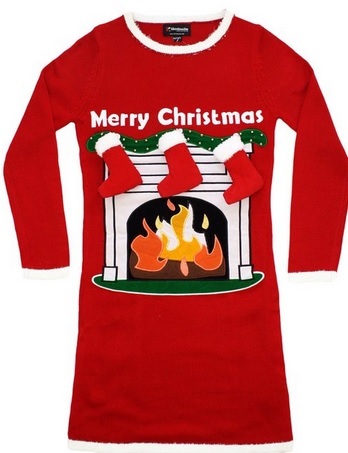 It’s a fireplace lighted Merry Christmas sweater for sale! Yes, there are cool LED lights on this sweater to make it look like the fireplace is really on fire! Look who’s very excited to participate in your Christmas party! How do I know he is super excited? 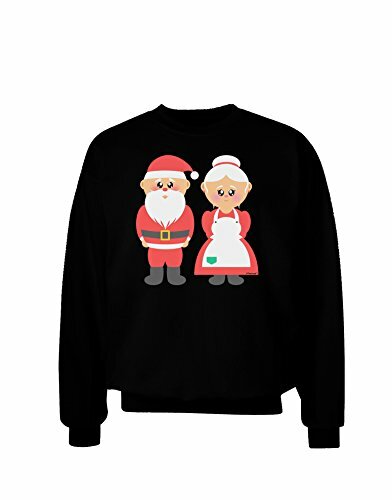 Cute, fun and colorful Mr. and Mrs. Santa Claus together adult sweatshirts for sale in 4 fun colors! *Now it’s time for the guys! 21 Fun Christmas Sweaters for Men!